Though seemingly at odds with the modern world, these striking folk songs still manage to get their own message across. 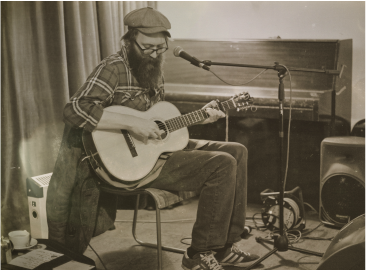 The first album from folk singer Jim Evans, appeared in 2014, called ‘On Seeds and Shoes’, it was a minimalist piece of work, yet the depths explored took the listener right into music with a beating heart. The follow up ‘Milk Teeth’ (releases 28 May) is equally unpretentious and just as powerful. And in the way of certain straightforward, unassuming albums its simple delivery belies its potential and perception. Without doubt, Evans writes a meaningful song with lyrics that reflect his world-view yet oddly enough strike multiple chords with a wider audience, listen and it’s not too long before you find yourself identifying with the words he writes. His music owes much to the influences of Americana folk and in many ways that’s where you hear the simplicity and forthright delivery of the genre coming through. Conveyed with a world-weary, far-travelled, somewhat plaintive vocal that does so much to take you ‘inside’ their messages, the songs on ‘Milk Teeth’ should come with a warning ... listen to this just once and you will be addicited. The encounter begins with the acceptance of mortality within ‘It’ll Break’, moves through the hook-rich ‘Shine On Me’ the homage to experiences in ‘Good As Golden’, perhaps the most profound song about love as it grows ‘Rather Than Compete’ and the true appreciation of ‘Half Way There’. ‘Milk Teeth’ has that mysterious, almost spiritual ingredient, it’s eminently memorable and the songs will stay with you. As the man says in‘All That I See’ ... “Today’s ears are open and embracing the thoughts that birds choose to sing. And although their message is not translated the tune in my head will surely ring.” And that surely sums up this music for it will continue to ring in your head. There’s a stripped back simplicity to this powerful coming together of gut-felt words and instinctive music from Jim Evans, singer, songwriter, guitarist and banjo player. This is music from the heart, primal as the pull of heritage, deep-drinking as long-lived roots, its reflection of tradition given life by its blend of folk, blues and country. And no this isn’t from across the pond, this is American folk from Bristol, England; but if you had to place a bet you could be forgiven for being several thousand miles off beam. There’s a laid-back feel, an almost terse delivery. Nothing there that’s not needed. No embellishment just one man’s contemplative view of life. The songs on Jim’s latest album ‘On Seeds and Shoes’ take you on a sometimes wistful, sometimes brooding but always thoughtful journey. The influence of American roots is so strong you can touch it. This artist expounds his stories through a genre that he’s clearly absorbed with a passion, and all you need to do is listen to share in that obsession. From ‘Seeds Sown’ through ‘The Day Disappeared’ to ‘The Fox’s Bark’ and ‘Callow Eyes’ you’re listening to a man telling it how it is, there’s no holding back on what he sees and what he says. The emotions run from anger to sadness, resentment to acceptance, and without reservation you’ll fall beneath their influence. ‘On Seeds and Shoes’ launches on 21st June. It appears that with Jim Evans, folk music is not only surviving, but positively flourishing in Bristol. 'On Seeds and Shoes' is Jim's second album, and follows on from 2012s '12 Folk Sons'. With this latest album, Jim has taken things a lot further. There are the sort of folk protest songs, that people usually associate with Bob Dylan, plus there are electric folk, and country style songs all delivered in Jim's unique style. His lyrics are absolutely excellent, with acres of observation, wit and humour - “Oh the day disappeared over the hill, with a magazine, carrier bag and a vitamin pill”('The Day Disappeared'). Stuff like this is rare enough, and when you have an album with twelve top tracks on it, you really can't go wrong. The opening track, 'Seeds Sown' falls well into the folk protest song environment, right from the start Jim delivers a healthy dose of realism “A morning is broken and it cannot be repaired”. This is a guitar driven folk song that is up there with the best, interplayed with some gentle harmonica work, as Jim tells it like it is: - “Challenge the ticking of the clock, and put their mitts up to their brow/ For what needs to be done can't be done tomorrow coz it needs to be done right now”. 'If I Had it My Way' move things up to electric folk music, with some excellent guitar work, and once again really strong self deprecating lyrics: - “Well if I had it my way, If I had it my own way/ If I had it my own way, the skies would not be blue but grey, if I had it my own way/ And if I knew myself, if I knew my own self/ If I knew myself then I would leave me on the shelf, If I knew myself”. Overall, this is a top class album, a real asset to the collection of anyone interested in the folk genre. let me set the scene a little. On this new album, Jim has the confidence to give us all 12 numbers from his own pen. of multi-instrumentalist Mark Legassick, well, it just oozed authority from first to last. seeks to go instead for rhyme. And the songs have decent, if unremarkable, melodies. a tune I cannot quite get out of my head. feeling it will win a lot more fans, than it will get detractors. Jim Evans’ new album, On Seeds and Shoes, is available to buy right now (http://jimevans.bandcamp.com/). The work represents the expansion of a singer, and of an artist. From live appearances involving solo versions of the songs on the album, the songs have been developed to become a band project, and On Seeds and Shoes projects Jim’s songs, showing his progression as a performer and songwriter. Jim’s previous collection, also available from his Bandcamp page, 12 Folk Songs, is mostly traditional in nature. From the straightforward and stripped down If I Had It My Way, to the exhilarating, detailed banjo on the Cockfight, Jim’s power and hold over the material allows him to bring new thoughts and directions to the traditional pieces, offering both echoes of English pastoralism and American roots. St James’ Infirmary recounts an episode in the song’s long journey, and When I Lay My Burden Down is soulful, searing, emotional and touching, reflective of the tradition as a whole – as it moves, it moves us. On Seeds…projects a different light on things, with band arrangements adding depth and character to the songs. Opener Seeds Sown builds nicely, from a background harmonica to an invigorating classic country-esque wall of sound. Work Is Done rolls along with a full banjo sound and roaring, joyous fiddle accompaniment. The song introduces the beautiful backing vocals of Rebecca Philip. Angharad Jenkins’ lifting fiddle begins The Bottle Is Full, a great example of Jim’s weaving, impressionistic songwriting style, which is continued by The Fox’s Bark, one of the most lyrically interesting of the songs, delivered in a tender and understanding way, with wistful backing vocals and guitar figures. The song allows us a glimpse behind the scenes of everyday life. Much of the direction of the album is given by its production by Mark ‘Howlin Lord’ Leggasick, who also provides guitar, bass guitar, mandolin and backing vocals. The work embraces a range of styles, with Grief Gone Wild showing off a nicely layered mix, which introduces a sprightly, flowing organ. Song For Gembo demonstrates an interesting recitation style, moving into an old time-feeling fiddle and banjo backing. A comparison between 12… and On Seeds…shows that the identity of songs, as well as their singer, is not always fixed, but remains fluid, with changes of circumstance and intention. Throughout his work, Jim is confident in himself and his songs, which, on On Seeds…are brought out by their production and arrangements. Jim’s singing is homely, comfortable and confident, direct whilst able to weave around the words. We are offered glimpses into Jim’s world via the humour and sweetness of Working Title and the view of life and the world of and Everything In Between, and this perhaps is the point of the album – a look at the world through personal eyes – and it does this very well. On Seeds and Shoes is a joyous record, acting as both a personal statement of the artist, and also as a gift to the world. Songs develop in artists’ repertoire and don’t remain static, and the album is testament to that. The band arrangements add soul, feeling and depth, but the voice and the songs ring loud and clear.